This week I have three days in a row of amazing freebies for you, being kicked off today! And what's the topic? Well by the title you've probably guessed -- "The Hoosier State." Most of you that have followed my blog (or notice the blog design or header) know that I'm a Hoosier girl... originally from Indiana, but now living happily ever after in Canada for over two years. I decided to create a big freebie kit dedicated to where I grew up because I'll always have a soft spot in my heart for the Hoosier state, even if I don't technically call it "home" anymore. I finally finished the kit last night, and together there are 8 papers and 40 different elements in this one including wordart, frames, mats, ribbons, peonies, notepaper, corn (lots of corn! ), clips, buttons, bows, and even a few acrylic elements and wooden pieces such as the state flag, the state itself, and some Indy 500 items. All in a colour scheme that reminds me of Indiana. The kit was too big for one zipped file so I decided to break it up into 3 pieces and release all of the parts over the next three days. Each day contains at least two papers and a random handful of the 40 elements. This Friday's Freebie Friday will be the final piece, and once you download all three, you'll have the entire kit. Don't forget that this freebie kit is for personal, non-commercial use ONLY, as specified in the TOU included with all of my freebie downloads. Please be sure to read the TOU before using any of the items in the kit, and contact me if you have any questions about it. 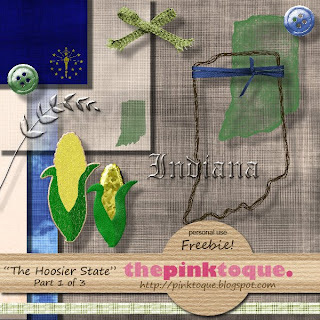 Download "The Hoosier State" Part 1 of 3 HERE! Thank you! Your blog post will be advertised on the DigiFree Digital Scrapbooking Freebie search engine today (look for timestamp: 04 Sep [LA 12:00am, NY 02:00am, UK 07:00am, OZ 05:00pm] ). Thank you so much! This is such a great kit! My brother recently moved to Indiana and I can use this for the last pages in the heritage book I'm doing for Christmas. I'm doing four books for the two of us and our cousins, each with the same first chapter, our paternal grandparents, but then personalized from there. His last chapter will be completely unique and will end with his move and new Hoosier-girl wife to be. This kit will be prefect! Again, thank you so much!